Leadership coach Susanne Madsen shows why having an innovative team helps you to stay current, and how to embed innovation practices with your team so you can stay competitive. Compliancy means failure, Susanne said. With technology advancing so quickly, if you’re not invested in staying up-to-date and making sure your team is innovative, then you’re going to be left behind. It’s not as hard as you may think because people want to learn. As a leader you have to cultivate this innate capacity and help guide it to fruition. There are many ways to promote innovation on projects, Susanne offered these pointers to chart your team to innovation. By following these simple guidelines you can direct a more creative and productive relationship with your team and the project. Pro-Tip: It’s good to give your team autonomy to play with ideas while still in the planning stage. It empowers your team to find solutions and not just complete tasks. Hi, I’m Susanne Madsen. 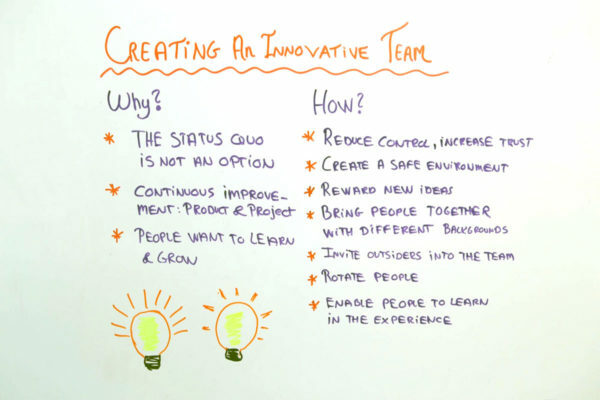 Welcome to this whiteboard session on how to create an innovative team. But why does it matter? It matters because the status quo is not an option. We cannot stand still. If we do, then we may actually be falling behind, because the world is developing at a rapid pace. Technology is improving all the time, and the world is also becoming more competitive. So we have to continuously improve and innovate. We have to improve the way we do products and the way we do our projects. If you don’t work in a space where product development is the order of the day, at least you can review how you execute your projects. Also keep in mind that people want to learn and grow. It’s a basic need we all have. We want to develop, to learn, to grow, and to get better at things. You can tap into that human need by enabling people to innovate on your team. First you have to recognize that you must reduce control and increase trust. Some managers are very, very controlling. They want to know where people are, what they’re working on every minute. That hampers innovation. We also have to create a safe environment where people feel it’s okay to come forward with ideas. But not only that, we have to create the time for unstructured thinking. If people are utilized 100% during the week on tasks, where are the good ideas going to come from? When will they ever be allowed to work on something new or exciting? You also have to reward new ideas, to encourage people to continue and to show that this is the way we are working around here. We cannot stand still. You can also bring people together with different backgrounds. The best way to learn is to observe how other people work. We can steal good ideas from other industries or other teams and implement them on our projects. You can also invite outsiders into the team. That might have the same effect. They bring new knowledge with them. They bring new ideas. Rotate people. Break down the silos. Silos stifle innovation. We need to learn from how we do it in other areas. And lastly, enable people to learn in the experience. Why wait until the end of a project to look at how we executed it? Why not chunk the project up into phases? And each time we’ve hit a phase or delivered a major milestone, we review how we went about it and what we can learn, how we can improve, and do better in the next phase.